We have chosen a car for its ease of use, visibility, comfort and safety. It has a euro ncap 5 star safety rating. Nine airbags - includes driver and front passenger Advanced Airbag System, driver and front passenger seat-mounted side airbags, driver knee airbag, driver and front passenger seat cushion airbags, and front and rear side curtain airbags. Full air conditioning for your comfort all year round. A steering lock to u turn in only 10 metres. 'Touch and Go II' multimedia system. The lightest engine in its class, the Yaris has also shed 20kg relative to the last one making it quicker and more economical. What Car? 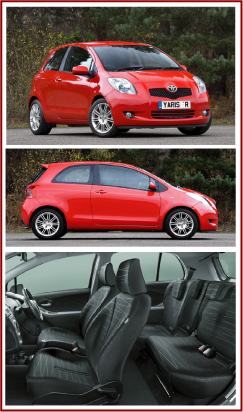 says The Toyota Yaris 1.33 VVT-i ICON is our favourite version of the Yaris. The engine is the perkiest of the bunch, and ICON trim gives the best balance of equipment and affordability.